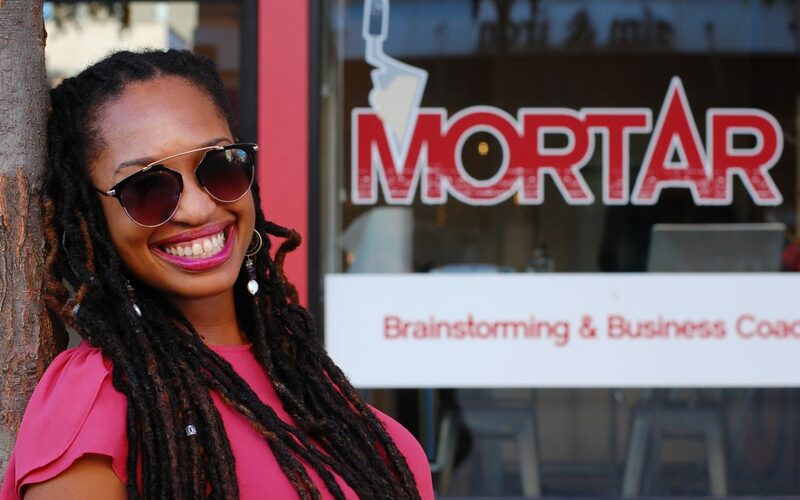 I kept hearing about this amazing program that was ACTUALLY helping black entrepreneurs in the Cincinnati area to get their businesses started. Being an entrepreneur myself, this sparked my interest on many levels because it has been challenging to maintain my fashion business here in Cincinnati without the support that I’ve needed to continue manufacturing and distributing my line. I don’t blame it all on being black, but I felt like I didn’t have a place, and the same amount of backing and support that I received in California. I wanted to make it my own personal mission to support and ensure the success of Mortar because it is extremely valuable to the community and Cincinnati needs this. It’s been a long time coming. If you could only listen to one musician/artist/band for the rest of your life, who would that be? Why? This is a hard one, because I really love music… and this seems so cliche’, but I’m gonna go with Bob Marley. I love the vibration and messages in his music. There is never an occasion where Bob Marley isn’t the guy to listen to. He lead a movement of people through his passion and dedication to getting his words out to unite the people, and I believe that it’s very similar to the mission that we are on right now. If someone was visiting Cincinnati for the day, what 3 places would you suggest they go? Skyline, Neons, Ault Park, and that cute little pop-up shop on Vine Street (I know that’s 4 but I couldn’t help it). I believe that it is imperative to build-up the community through entrepreneurship. It’s like the Chinese proverb goes “You give poor man a fish and you feed him for a day. You teach him to fish and you give him an occupation that will feed him for a lifetime.” If you give the community the tools it needs to create their own businesses you can create a thriving community that is passionate and supportive. In all honesty, if you look at a low income community, that has a bunch of drug dealers on the corner, those are the entrepreneurs of the community. Now if you take those same drug dealers, and teach them a few skills about how to create an actual viable business, they can apply a lot of the skills that they use on the streets and apply them to making some “legit” money. If you give people in under served communities the opportunity to build their own businesses, you reduce violence, poverty, drug abuse, and all of the illnesses that affect the black/ community. Look at Black Wall Street. Those were the good ol’ days. I strongly believe that entrepreneurship is the cure to uplifting not only the community, but the world as a whole. It’s a Friday night after a busy week at the office – how do you relax? It really depends, but most of the time, I look forward to cuddling up with my husband, and watching revolutionary/ inspiring documentaries and just chill with a glass of wine or bourbon. Sometimes we may link up with another one of our married couple friends and go to an art exhibit or whatever the latest event is on Groupon. Sometimes, we like to double date with my parents and go to The Greenwich to listen to some relaxing jazz. Last Friday, we went to the Legends of Southern Hip Hop concert and had an absolute blast listening to all the hits from the 90’s. We try to keep a balance of being that old, chill married couple, and really cool adventurous kids that like to try new things. Historian, Dr. John Hope Franklin often told his students that the past is prologue to the future. I think if we take a page from the Black Wall street era and continue to focus on what really makes us free and pushes us forward, we will be indestructible. I believe that freedom is having the ability to fully and completely express yourself to the world in a way that’s undeniably seen and felt as a God send.